It's not hard to teach a dog to do tricks, and sometimes even a cat. But spiders? Well, it's not easy, but scientists at the University of Manchester managed to train a spider to jump on command from one platform to another. They wanted to study the mechanics of a jumping spider to help engineers develop micro-robots, but filming a random jumping spider in action would be a grueling task. So they set out to train one. It took a lot of patience. The first few spiders they tried to work with had no interest and simply walked away from the platforms. Some of the other spiders froze up, dumbfounded at what the scientists were trying to make them do. Finally they came across Kim, a female Regal Jumping Spider, who was willing to learn, and after a few weeks she was a trained jumper, "allowing scientists to record, monitor and analyse a spider’s movement in high-resolution 3D for the very first time," according to The Telegraph. The aim of the study was to understand how jumping spiders modify their speed and trajectory when jumping long or short distances or leaping upwards. A jumping spider can leap up to six times its body length from a standing start. The best a human can achieve is about 1.5 body lengths. The researchers were anxious not to skew Kim’s behaviour by tempting her to the other platform with food, as they would only have seen a predatory jump rather than recording the full range of her abilities. Instead, over several weeks they placed Kim backwards and forwards between the ledges until she finally got the idea of jumping between them. 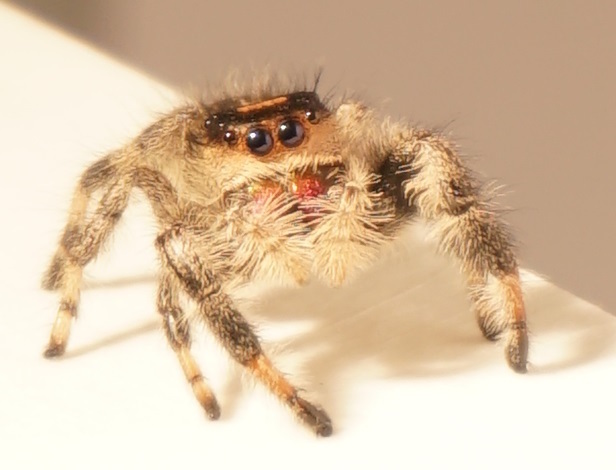 Kim has since died – jumping spiders only live up to a year – but below is a video by the University of Manchester showing their work with Kim. And here's a paper about it published today Scientific Reports.